People who idealize and romanticize beekeeping — I would guess that’s 99% of all people who have ever gotten into beekeeping, including me — are in for a big wake up call after they kill their first colony. Sometimes colonies die of natural causes, but whatever the reason, a hard fact of beekeeping is that bad things happen and colonies die. If honey bee colonies can die in nature even under ideal circumstances, they can die in a beeyard too. The ragged queen during better days (when she was alive). I opened the hive body and found the queen dead in the cage, the sugar plug only partially eaten away. (No photos.) The bees may have stung and killed her through the cage. Perhaps the “hair roller” cages don’t provide protection from stings. I know they’re designed for queen-rearing purposes, not necessarily for installing queens. Perhaps I should have let the bees be queenless longer before I installed the queen so they’d be more likely to accept a new queen. I also didn’t put the cage perfectly centered between the frames. It was about a third the way back from the front of the hive. 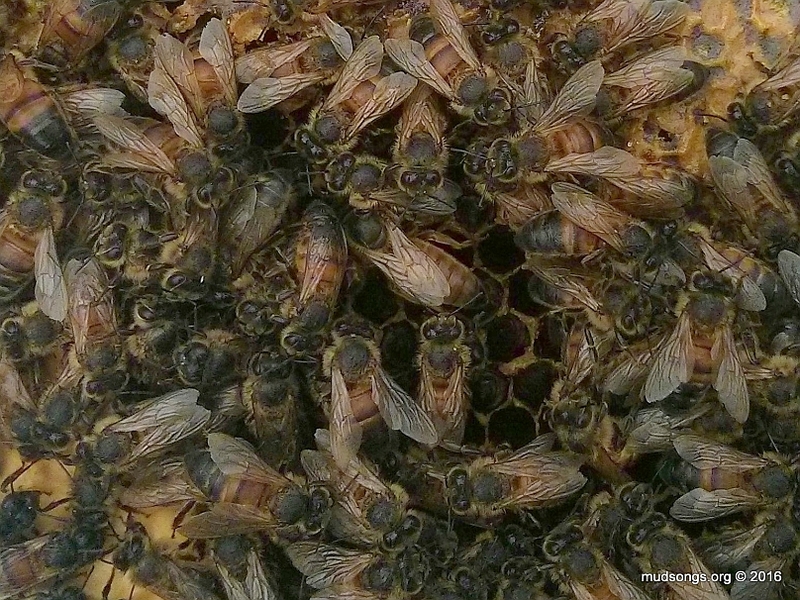 When I opened the hive, the bees were clustered in the very centre of the frames — and the queen cage was outside the cluster. She would have froze to death outside the cluster thanks to the Arctic winds that have been battering the hive. Late-breaking news: I found this photo. The queen may have also been failing regardless. She was a late-season supercedure queen that may not have mated well. Her and the colony’s demise may have been inevitable. In any case, all my attempts to save her were desperate, on-the-fly efforts. If I’d had more time and had put more thought into it, I might have made more successful moves. Overall though, except for that last move, I think I did alright under the circumstances. I still think heating a nuc box with a light bulb would have worked if I’d discovered the starving colony earlier when the cluster was larger. If I had to do it again, I might use a large tin can with tiny holes in it to cover the light bulb. That would warm the nuc and block the light all at once. No cage or red light required. A regular hive body with a screened bottom board and a heat source underneath might work too. It’s a desperate move no matter how you look at it, but I’ll work something out by next winter in case I have to do this again. Prevention is the best cure, though, so I’ve decided to bite the bullet and spend the extra cash on a thermal imaging device for my smart phone. I discovered the starving colony too late. A thermal imaging camera would have revealed the problem long before the colony was at risk of starving and I would have been able to take action to correct it. I’ve already ordered one of the Flir One devices ($372.84 after taxes etc. ), which are hard to come by in Canada. Another cheaper brand called Seek is readily available in Canada, but the Flir seems better suited for my needs. It’s not the kind of money I’d spend just starting out, but I’ve worked too long and hard to get where I am now with my beekeeping. I’m not in the mood for unnecessary loses anymore. I’ve also learned from all this that I need to be more assertive in the winter with my beekeeping. Other than tossing in emergency sugar feed, I don’t usually pull frames or do anything with the bees in the winter. Starting next winter, though, if I notice anything unusual, I’m moving in. I monitored all my hives with a stethoscope this winter. While not a precision instrument, the stethoscope provided me with information on the general size and location of the cluster. The sound of the cluster in the starving colony became noticeably subdued a few weeks before I pulled any frames. I should have acted right away instead of waiting a few weeks. I also noticed the bees clustering to one side of the hive and didn’t think much of it (they were cut off from their honey supply by an empty frame of foundation). I should have moved honey frames next to the cluster as soon as I saw that. After my experiences of the past two winters (first with shrews and now a starving colony), I’ve come to realize that if something isn’t right, I need to act fast. Lesson learned. As for discovering the dead queen, cursing and moving on, my next move is to take the cluster of bees in my now-queenless hive body and combine it with another hive. I’ll use the usual “newspaper combine” method. I’ll add it to one of my weaker colonies and hope for the best. Life goes on. This entry was posted in Dead Bees, Gadgets, Money, Nucs, Queen Cage, Queenless Colonies, Queens, Year 2016 and tagged Ragged Queen. Bookmark the permalink. How disheartening! I’m new to beekeeping and must be having beginners luck–I know losing a colony will happen sooner or later, but I can’t imagine what that must feel like the first time. 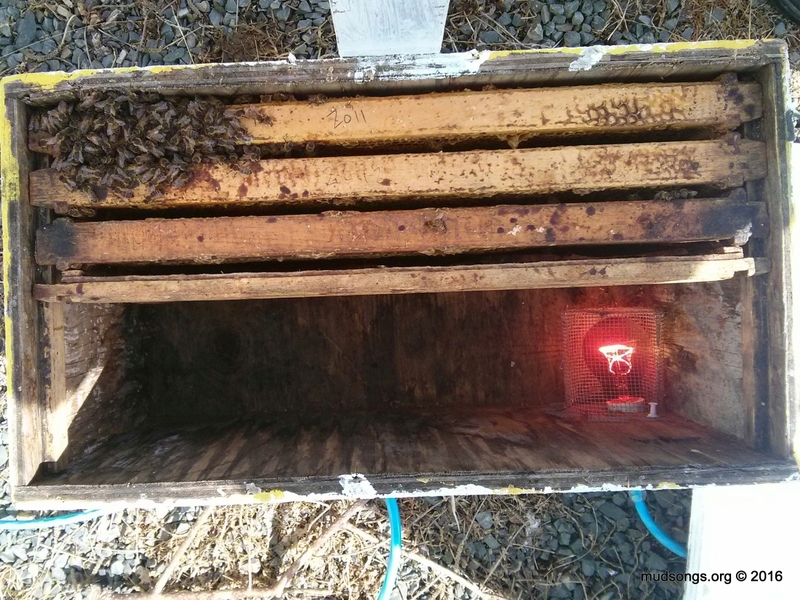 If it’s on a level with what you feel when you see your first bees–well, I sad for you. You get used to it. I didn’t lose my first colony until my third winter. 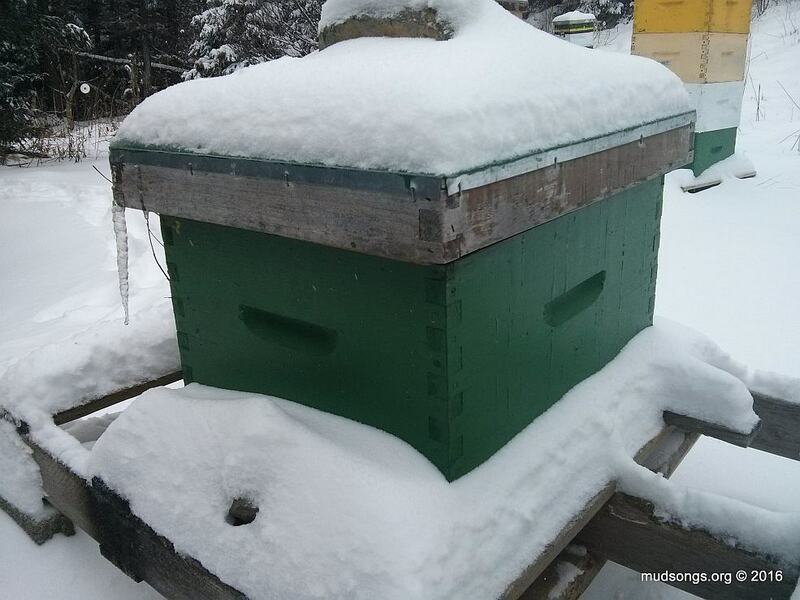 It was the first winter after I was forced to move my bees (thanks to an unfriendly neighbour) to a rural location where I wasn’t able to check on them easily in the winter. I think I would have been more discouraged if it had happened during my first year. Except for last year when shrews killed 75% of my colonies, I think I’ve lost about one colony per winter, usually from queens dying of old age. In the end, though, it all balances out because the leftover drawn comb from a dead colony is worth its weight in gold. 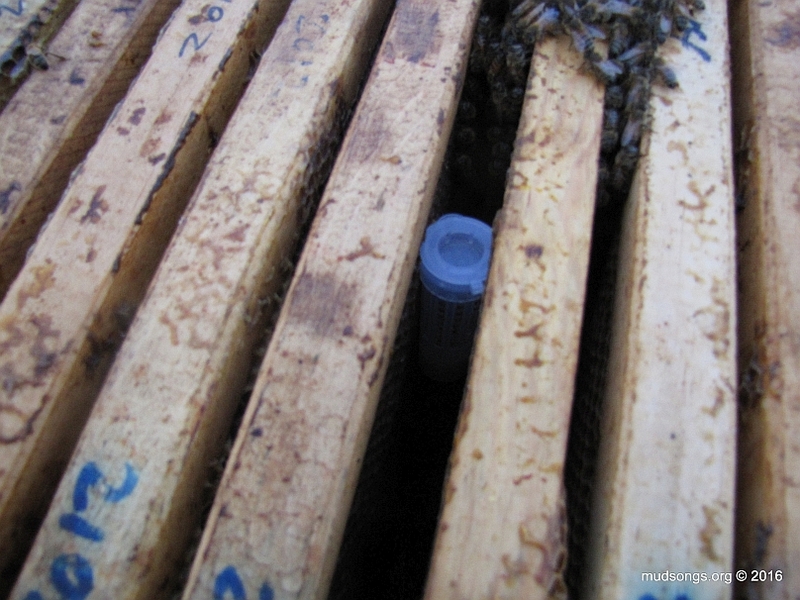 Drawn comb may be the most useful thing in a beekeeper’s tool kit. Three days ago I set up a heating lamp beneath the hive of one of my weak colonies, a small cluster of bees I’m sure would die from the cold weather that’s forecast for the next two weeks (well below 10°C, plus more snow). I normally wouldn’t bother with something like this, but it has the potential to be an interesting experiment, so I’ll give it a go. I’m documenting the experiment and will post the whole thing at a later date if the colony survives.